With thousands of fans in the Windy City, Chicago Cubs is one of the most exciting entertainers in the city of Chicago. In the ever growing city, the team has played its role well in keeping people's appetite for entertainment sated. Headquartered in Chicago, Illinois, the franchise was founded in 1870. Cubs are known for their fierce rivalry with teams like St Louis Cardinals, Chicago White Sox and Milwaukee Brewers. Draped in red, blue and white, the uniform is perfectly designed with pinstripes and the cap insignia of their initial C in red. When it comes to the performance of the team, the Cubs hold a special position amongst all other baseball teams. For more than a hundred and one years, the team has been struggling to win a decent championship.The Chicago Cubs have had their days, oh yes that is right! There was a time when they were big.They were on the top of their game in the late 1910s when they won two consecutive World Series Titles which sure did send all Cubs fans over the moon. Now you have the chance to watch the Cubs as they take on a number of rival teams as part of their Spring Training. To watch them live in action, grab your Chicago Cubs tickets now. The Chicago Cubs have had an eventful 2016 season so far. The season’s first quarter had its fair share of ups and downs and the Cubs’ fans are enjoying the topsyturvy ride. The Cubs started the 2016 campaign as the hottest team in the MLB; they hit the ground running and got off to their best start since the 1907 season. Helped by the efforts of players like Jake Arrieta and Dexter Fowler, the team established a significant lead in the National League’s Central Division and looked to be cruising to the playoffs. However, the team met with several speed bumps, mostly in the form of injuries. Jason Heyward and Kyle Schawber were both sidelined and squad’s depth and the team’s mettle were tested during the opening weeks of the season. The team’s results were poor in the latter half of the opening quarter, but their good start means that they are still in a very good position. As it is, the Cubs have finished the first quarter with a 29-13 record, which is currently the best in the MLB. The team leads their division with a six game lead over the second placed Pittsburgh Pirates and statistics are suggesting that they will be the only team to cross the 100 win mark this year. If the Cubs can maintain this form till the end of the season, they can very well win their first pennant since 1945 and reach the World Series once again. Only time will tell if that does actually happen. They have a longer history with NL Pennant titles than they have with the World Series. Their first NL Pennant title came in 1870. Over the period of time, they have managed to win 16 NL Pennant titles. Their last victory came in 1945. Their performance in the Central Division and the East Division has also been that of a star team. Their latest victory in Central Division came not too long ago, in 2008, where they won the title. The Franchise was founded in 1870 as the Chicago White Socks. Two decades later, the name was changed to Chicago Colts. Then finally in 1902, the team was finally called what it is today; Chicago Cubs. Wrigley Field has played home to the team ever since 1916. The team is owned by Joe Ricketts and is currently controlled and administered by the Chairman Tom Ricketts. Lou Piniella is the current Manager of the team whereas Jim Hendry is the General Manager. The team may be having a hard time right now, but it is surely one of the toughest competitors on the baseball pitch. That is why the team has a very loud and proud fan base which stands behind the team through thick and thin. Cubbie, the cute little bear cub is the official mascot of the team. But interestingly enough, Chicago Cubs is one of the very few teams which does not have a physical mascot even though there is a man wearing a polar bear kind of outfit on various Cubs games. He is known by many names like the B Man, The Bearman or the Beeman. He is not exactly popular with the crowd. That is why the club fired him after he served the club for a very brief period of time. Ever since, the crowd cheers itself per se by songs like Go, Cubs, Go! Eddie Vedder's ‘All The Way’ is also very popular amongst the fans. Vedder himself is a long time fan and supporter of the team. The best thing about the Cubs is their fan friendly attitude. Even though the team has not been performing as per the hopes of the fans but there is something about the team that their fans just cannot bring themselves to abandon it. Whatever the reason maybe, the team truly deserves it. If you too are a fan there is no reason why you shouldn’t buy Chicago Cubs tickets straight away for they are up for grabs now! Finally, the Chicago Cubs ended their 108-year World Series drought. The team is still basking in the glory of their 2016 championship win in which they defeated the Cleveland Indians 4-3. Looking ahead into the new season, the oddsmakers believe that the Cubs are on the right path and have a potential dynasty on their hands. With a young roster in place and more or less the same lineup that helped in lifting the coveted trophy, the Cubs are poised for an exciting spring training session. The regular season also looks quite promising for the Cubbies and diehard fans are already buying their Chicago Cubs tickets in advance. The I-94 Series is the name given to games between the Chicago Cubs and the Milwaukee Brewers. The rivalry kicked off when the Brewers made the move to the AL's Central Division in the year 1998. The two sides met for the first time ever on June 13, 1997 at the legendary Wrigley Field. The Cubs lead the head-to-head record 173-162 as of May 28, 2018. These two teams are yet to meet in the playoffs though. The Chicago Cubs also have a heated rivalry with the St. Louis Cardinals. It is one of the fiercest rivalries in all of North American sports too. The Cubs lead the head-to-head regular season record 1222-1165 as of May 28, 2018 but the title haul is different. The Cardinals have won eleven World Series compared to three by the Cubs. The Chicago Cubs also have an intercity rivalry with the Chicago White Sox. Since both sides are members of the different leagues, they do not meet that often. The White Sox lead the head-to-head 59-56. The Cubs also trail the White Sox 4-2 in the postseason as of May 28, 2018. It will be interesting to see who comes out on top the next time these two Windy City rivals collide. Ben Zobrist is now 35 years old and hence his workload will be managed this season by the current World Series champions, the Chicago Cubs. Ben played one hundred and forty seven games last season but now Joe Maddon has more or less confirmed that the amount of work that Zobrist has to do will be managed. That applies to what he does during spring training and the regular season. This is a very sensible approach to take regarding a player in the twilight of his career but one whose value to the Cubs cannot be understated. Where do the Cubs play in spring training? The Chicago Cubs of the MLB plays its home games at the Wrigley Field while its Spring Training home is the Sloan Park. The ballpark can accommodate about 15,000 attendees. It is the biggest spring training stadium in the MLB in terms of capacity. The schedule for the Cubs’ Spring Training 2017 is out. They will be taking on a number of rival tams including the Los Angeles and Cleveland Indians. Check out the itinerary and make reservations at the ball park to watch your favorite players live in action. Baseball season is here and is packed with epic matchups. You can catch all the action live as it happens. Next event featuring Chicago Cubs will be Chicago Cubs vs. Arizona Diamondbacks, held at the Wrigley Field in Chicago. As of now, the last event, St. Louis Cardinals vs. Chicago Cubs is scheduled for 29-Sep-19 at the Busch Stadium in St. Louis. For complete itinerary of events, please visit our website. The average price for Chicago Cubs Tickets start from $61. The minimum get in price is $6 for Chicago Cubs Tickets at the Wrigley Field, Chicago. For a detailed look at ticket prices and amazing discounts, visit our website. 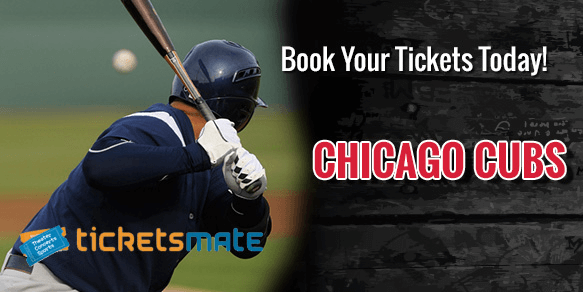 Use Event18 as the discount code and get up to 70% discount on Chicago Cubs tickets. This is a last minute opportunity to get the discounted tickets for Chicago Cubs. Q:Who do the Chicago Cubs face on opening day 2018? A:The Chicago Cubs will kick of the 2018 regular season on April 3rd, 2018, by taking on the St. Louis Cardinals. The Cubs will have to travel to St. Louis for the game and fans will hope for a repeat of last season's opening day, which the Cubs won away at the Angels. To catch the defending World Series champions live in action this year, as they look to defend their crown, get Chicago Cubs Tickets from this website via our certified brokers. Tickets are available at a range of prices and you will be sure to find ones that suit your budget requirements. Q:When was the most recent of all the Chicago Cubs championships won? A:The Chicago Cubs won their most recent World Series title only last year in 2016. It was a huge moment in the franchise's history because it ended a 108 year wait for the Cubs and their fans. Now the Chicago Cubs will look to consolidate and defend their crown. Chicago Cubs Tickets are in high demand right now because there is a lot of optimism surrounding the team. If you want to see how the season pans out for the reigning World Series champions, then book your tickets and watch them play live. Q:Who is the coach for the Cubs? A:Joe Maddon currently manages the Chicago Cubs (MLB). Maddon's coaching career took off in 1993 with the California Angels. He has managed Tampa Bay Rays and Los Angeles Angels as well. He is a three-time BBWAA Manager of the Year award winner. Maddon is known for his great sense of humor and is as one of the most entertaining coaches around in baseball. Maddon believes in making the sports more fun as he puts it, "Never permit the pressure to exceed the pleasure." It is surely a pleasure to see a team lead by him in action. So get Chicago Cubs tickets and get ready to be entertained. Q:When did Theo Epstein go to the Cubs? A:Theo Epstein joined the Chicago Cubs as the team's president in 2011. He was previously associated with the Boston Red Sox as their general manager for 9 years. His hiring by the Cubs not just increased the sales of Chicago Cubs tickets but also ended the team's 108 years' drought of winning a world championship. Q:Who is going to be the Cubs closer? A:The Chicago Cubs won the World Series in the year 2016 for the first time in 108 years. Now they head into the 2017 MLB season with some new faces on the roster. One of them is Wade Davis. The closer was signed by the Cubs from the Kansas City Royals. Davis had spent three years with the Royals and he is now most likely to be Cubs' closer during the upcoming campaign. You can book your Chicago Cubs Tickets from our brokers and watch Wade and the Cubs defend their World Series title this season. Q:What channel is the Cubs game on tonight? A:Several sports channels broadcast live coverage of baseball games. It's best to check with your cable operator in advance. The extent of coverage varies from channel to channel. While some just broadcast the live game, there are others that also cover the pre and post game proceedings. You can also check the prices of Chicago Cubs Tickets on our website. If there is a chance you can attend the game live, then why miss it. Q:I need Chicago Cubs 2018 Tickets on an urgent basis. When can you deliver them to me? A:Chicago Cubs have won the World Series championship three times. You can watch them live in action by buying your Chicago Cubs Tickets from our brokers. Your tickets will be delivered through FedEx and given their reputation, you will receive your tickets soon within a week. Q:If i buy chicago cubs tickets 2018 from your website, will you make sure that the seats are together? A:All seats are together with Chicago Cubs Tickets bought from our website unless there is a prior mention of the splits. Q:Are there any chicago cubs tickets deals going on? A:Chicago Cubs Tickets are sold at relatively low rates on our website and other than that you can enter the discount code to get further discount. Q:How soon will the cheap chicago cubs tickets go up for sale on your website? A:Chicago Cubs Tickets are already up and selling on our website. Do log on to make the most of our cheap rates. Q:Are discount codes for cubs tickets available on your website? A:Sure, codes for the Chicago Cubs Tickets are available on our website for all our valued customers. Make the most of them today! Q:How to get discounted cubs tickets from the venue? A:Chicago Cubs Tickets can be got from the venue but they may not be selling for very cheap rates. You can easily order them on our site at very cheap rates and have them picked up from the venue. Q:Can i get the chicago cubs ticket coupon code 2018 even though i am not a member on your site? A:There are no membership requirements on our website and all our valued customers can get the Chicago Cubs Tickets from us. Q:Can i get buy cubs tickets cheap from the venue? Q:Can you email me the prices for the nationals play cubs discounte tickets? A:Please log on to our Chicago Cubs Tickets page and there you will find all the details about the tickets there along with prices. Q:Are the simply cheap tickets promo code cubs also available for those who are not members at your site? A:There are no membership requirements on our website and codes for the Chicago Cubs Tickets can be availed by all our valued customers. Q:Do i have to register as member on you website to get the discount code for chicago cubs tickets? A:There are no membership requirements on our website and the Chicago Cubs Tickets can be availed by all our valued customers. Q:What does "GA" mean for the cheap cubs away tickets 2018 ? A:GA stands for "General Admission". It means that the Chicago Cubs Tickets cannot be reserved and will be sold on first some first served basis. Q:Hi, can the cub tickets discount code 2016 be used on other ticket genres? A:Yes, the discount code that you use on Chicago Cubs Tickets can be used on all other tickets on our website. Q:I have got some cheap tickets for chicago cubs, are you interested to buy them? A:No, we do not buy the Chicago Cubs Tickets from our customers. Q:How do I use the chicago cubs tickets 2018 coupon? A:You need to use the coupon at the checkout page when buying Chicago Cubs Tickets. Q:What is the best way to buy chicago cubs tickets? A:Simple go to the Chicago Cubs Tickets page and choose your own seats before you order the tickets online. Q:Can i win chicago cubs tickets 2018 for free? A:No, as per the company policy, you cannot win Chicago Cubs Tickets for free. Check out the directions and place the order as early as possible. Q:Before i order the best best chicago cub tickets i want to take a look at the seating map of the venue. How can i do that? A:Please visit our tickets website and you will find the option of viewing the seating map there. Q:How long will it take you to charge me for the cheap chicago cub tickets? A:It usually takes us one business day to charge credit cards after the customer has finalized the purchase from our website. Q:Do you know what is the best website for cubs tickets? A:We are offering You can get Chicago Cubs Tickets on reasonable rates with special discount codes. Check out the instructions and place the order right away. Q:Is the online purchase of excite tickets chicago cubs safe? A:Yes, we are certified by trusted authorities and allow the exchange of Chicago Cubs Tickets in a secure environment. Q:Till when can i get discounts for cub game tickets? A:You can get discounts for Chicago Cubs Tickets till the date of the event. Check out the directions and place the order right away. Q:Can i get chicago cubs 2018 tickets on discounts? A:Yes, the discount offer on Chicago Cubs Tickets is active already. Check it out and place the order as early as possible. Q:Are there any delivery charges for cub tickets? A:Delivery charges for chicago cubs Tickets are included in their price published online. There is no additional cost. Q:What is the policy to get cubs discount codes? A:There is no specific policy of getting discount codes of chicago cubs Tickets. Anybody can get it by following simple instructions online. Q:From where can i get coupon codes for cubs tickets 2018? A:You can get coupon codes for chicago cubs Tickets online while purchasing the tickets. Just follow the directions and enjoy cheap rates. Q:Do you offer good seating arrangement with chicago cubs discount tickets? A:Yes! The seating chart is available online, choose your preferred place before making the order for chicago cubs Tickets. Q:Are tickets for chicago cubs still available on discount? A:Yes! We are still offering tickets for chicago cubs on the same discounted rates. Check them out online and place your order as soon as possible. Q:Do you have any criteria for getting cub tickets coupon code? A:No, there no specific criteria for getting cub tickets coupon code. Anybody can get it by following simple instructions online. Check it out and place your order. Q:How can i avoid paying chicago cubs tickets delivery charges? A:I'm sorry but delivery charges can't be avoided. They are included in the cost of tickets. Q:I am looking for cubs tickets. A:You will find the Chicago Cubs Tickets best at events.excite. Q:While searching for promo code busch gardens, i was taken to your site but cant seem to find it anywhere. where do i look for it? A:Just get in touch with our Livehelp Reps who should be able to provide you with our discount code for Chicago Cubs Tickets. Use the code and enjoy nice savings! Q:Is it possible for me to get chicago cubs discount code? A:To receive accurate information on Discount Codes please visit our Live Help section. Q:Can I purchase cubs tickets 2018 at the event? A:Chicago Cubs Tickets can be purchased at the event.However, they may not be discounted. Q:I am looking for discounted calgary flames tickets. Can i get them form you? A:Sure! We are still offering Chicago Cubs Tickets on discounted rates.check the price list online and place your order. Q:How can i get chicago tickets discount code? A:Chicago Cubs Tickets discount code can easily be obtained from our live operators. Q:Are you still offering discount cubs tickets? A:Yes, the discount offer on Chicago Cubs Tickets is still active. Order them as soon as possible. Q:I'm getting chicago cubs tickets on your website. what are the accepted forms of payment? A:You can pay for your Chicago Cubs Tickets using Visa Card, MasterCard, American Express and Discover. Credit card are not accepted over email and please also note that bank drafts and checks are also not accepted. Q:Can the coupon code for cubs tickets in wrigley field be used for more than 10 tickets? A:You can use the coupon for as many Chicago Cubs Tickets as you want. Q:Have the chicago cubs discount codes 2018 changed? A:No, the Chicago Cubs Tickets discount codes are the same. Q:Can you help me get cheap chicago cubs tickets 2018? A:Yes, simply log on to our website to get the Chicago Cubs Tickets! Q:Do i need to be a member for getting cubs tickets promo codes? A:You don't need to be a member to get discount codes of Chicago Cubs Tickets. Anybody can get that by following simple instructions. Q:Am i eligible for getting cubs tickets college discount? A:Sure! Anybody can get the discount codes for Chicago Cubs Tickets by following simple guidelines online. Q:How am i supposed to get cubs discount codes 2018? A:You can contact our live operator in getting discount codes for Chicago Cubs Tickets. Q:Is there any policy of getting chicago cubs discount code 2018 or anybody can get it? A:No, there is no specific policy for getting discount codes of Chicago Cubs Tickets. Check the details online and place your order. Q:For how long will you offer cubs tickets promos? A:Cubs tickets promos will be offered as long as the tickets aren't sold out before the date of the event. Q:Till when can i get chicago cubs discount? A:You can get chicago cubs discount as long as the tickets aren't sold out before the date of the event. Q:Do i need to be a member for getting chicago cubs tickets coupon code 2018? A:No, you don't need to be a member for getting chicago cubs tickets coupon code 2018. Anybody can get by following the directions online!